There is a difference, I suppose, between losing one's mind or losing one's memory. The truth is one will surely follow the other. As I write this, my memory is in crisis. The mind is not perfect, but can function enough in a twenty-four hour period to get by. For example, I can clean the house, take care of the laundry, cook the meals, read the paper, read books and remember telephone conversations. The first two on the list are completed as I always have done them. The cooking part is a bit different in that I find myself forgetting how to prepare certain dishes, which I’ve been cooking for 50 years or more. Cookbooks are a Godsend but the “Family” recipes one has prepared without having to think have begun to escape me, and some of my efforts in that respect have turned out rather interesting. Reading books or the daily papers and remembering telephone conversations are a problem. Very seldom do I get beyond Chapter 1 of a book. Most of my reading, in the past, has been at bedtime, prior to going to sleep. With the memory loss I can’t remember what I read the night before, so I must re-read everything and with the effort and time it takes, the book becomes a garbled story of bits and pieces. So, the exercise makes very little sense. Crossword puzzles, which I have worked most of my life have been my salvation. I can “almost” work them as accurately and as quickly as ever. However; I must check the dictionary many times for the correct spelling, this is new. Telephone conversations are the one thing I dread the most. I love to hear from family and friends, but trying to listen and recall what is said is very difficult for me. Sometimes very important things are lost. I have tried to make notes as I listen, but the act of having to write down something takes my mind away from what is being said and my notes become a garbled mess of bits and pieces which do not make sense when looked at later. As each day passes I seem to lose a little more. There is a very deep sadness that goes with memory loss – the look in a persons eyes, when they realize I am not the same “old Barb”, the inevitable signs of irritability in a husband who must remind and repeat so many things each day. These sort of things begin to tell on a person and eventually we begin to realize our lives are so troublesome to other people that we sink further into ourselves, forgetting more and more each day. There must be a time when the caregiver is forced to let go and let God handle the matter and the person. My one wish is that my caregiver lets go of me soon – before he becomes the victim. 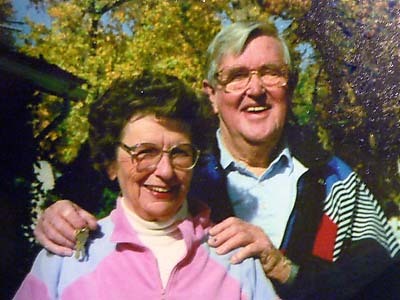 Barb was hospitalized in August of 2002 and Bill died in December of that same year.